When these two teams met in Greeley in January, it was Eastern Washington that was on the wrong end of a stunning, heartbreaking loss. On Wednesday night in Cheney, they returned the favor to the Bears. Northern Colorado led by as many as 17 in the second half and looked like they were firmly in control of the game, but EWU would not go away. The Eagles chipped away and chipped away, finally breaking through on a Parker Kelly three-point dagger from the corner to put EWU up 74-72. On the ensuing possession, Mike Proctor was called for traveling with 4 seconds left. EWU made one FT, and that was the final. 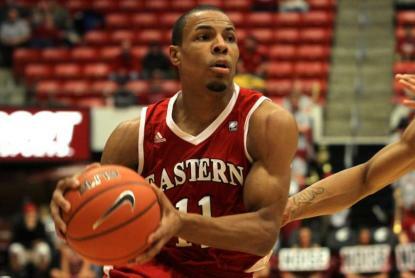 75-72 Eastern Washington, and a crushing blow dealt to Northern Colorado's hopes of defending their conference title in the Big Sky tournament. UNC came into the game 5-8, trailing EWU by a half game for the final tournament spot. With a home game against Weber State and road game against Portland State, they face an uphill battle. Cliff Colimon led the Eagles with 22 points, 9 assists, and 9 rebounds. He was the man that passed it up to find Parker Kelly for the game-winning basket, and should be praised for his unselfishness there. Kelly is a freshman, but has shown a knack in the past few weeks for hitting big shots. It looks like Jim Hayford has found himself a hidden gem. Kelly only had 9 points, but they came on three big treys late in the game. The Bears started the game hot, making seven of their first eight from beyond the arc. The rest of the way, they were 3/8, and EWU should be commended for tightening up. Connor Osborne led the way with 17 points, and he was solid all night. Tate Unruh had 16 points, but 12 of them came in the first few minutes - he was quiet after that. Close only makes it all the tougher for Northern Colorado, as they had a potential season-changing win right within their fingers, and they let it slip through. Barring a miracle, their season will end in two weeks at the end of the regular season and UNC will have to hang up their t-shirts until next year. They are a young team and they will be strong next year, but it will sting for a long time. For Eastern Washington, winning close games has been a problem for them all season long, which has to make this one especially sweet. They are in a great position to make the tournament, and they have the talent to win a game or two when they get there. The talent isn't the problem, it's the lack of BB smarts and teamwork. Maybe it's the poor coaching at EWU that is the problem. The pictures of Hayford on the EWU website are scary. The guy looks like a mini Hitler.